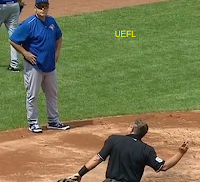 A flurry of check swing calls from plate umpires is today's Tmac's Teachable Moments lesson. 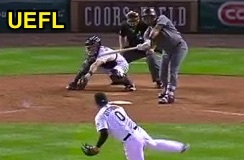 Which umpire has the batter as his primary? The idea that a base umpire always has a better view then the plate umpire is flat out wrong and if you work with a guy for any length of time who doesn't get check swings on the plate, the likelihood of him not getting them on the bases is also high. Let us take a look at some details of one of the most disputed plays in baseball. First, the rule. In the Major Leagues, check swing is not specifically defined in the rulebook, but is interpreted as "the batter's attempt to strike the pitched ball" (A STRIKE is a pitch "struck at by the batter and is missed"). BRD: In high school (NFHS), we're looking for the barrel of the bat passing the batter's body, and in college (NCAA), it's the barrel head passing the batter's front hip; no longer is "front edge of home plate" a rule. Pro/OBR codes make no reference to physical landmarks of the bat, body, or hip. So whose call is it? Rule 8.03(a)(4) states that the umpire-in-chief (usually called the plate umpire or UIC) shall, "Make all decisions on the batter." 8.03 also has the UIC call and count balls and strikes. Rule 8.02(c) states, "Appeals on a half swing may be made only on the call of ball and when asked to appeal, the home plate umpire must refer to a base umpire for his judgment on the half swing." E-072: Is this a swing and can it be appealed? IF the call is ball AND the defense requests an appeal, then the home plate umpire must refer to a base umpire. IF the call is strike, then an appeal cannot be made. As for the nuts and bolts of actually seeing this play, there are times when a plate umpire will get blocked out: perhaps the catcher slides in front of him on a pitch that misses a spot or he jumps up to grab a high pitch out of the zone. There are other times, however when the plate umpire has the best view in the ball park. plate umpire Alan Porter observes the swing. One of the keys to getting check swings is realizing when to give up on the pitch and focus on the bat. This is usually best done on pitches in the dirt when an umpire can focus on bat and ball as both are in the umpire's line of vision (it is also easier to do with a ball going significantly away). In this instance, the plate umpire will have the best view in the yard. However, on any pitch that is a strike or borderline, one of the hardest things for a young umpire to do is remain locked into the ball. We always want to get the primary call right, and for a plate guy, our primary call is the pitch. Ejection for leaving dugout to argue. How often have you said, "No he didn't go" and have the dugout ask you, "Where was the pitch?" and then you realize, "Oh crap I lost the ball so I could watch the bat." Always stay focused on the ball until you're 100% it's a ball. After all, as long as the ball stays in the strike zone, you're going to ring the batter up on a called strike, as opposed to a swinging one: the call of strike due to pitch location essentially renders moot the issue of swing/no swing. This aspect of umpiring is NOT easy and it takes working plenty of games to get right. For instance, in Ejection 008 (Larry Vanover/Kevin Cash, April 19, 2017), the ball appears to be 6-8 inches of the outer edge, which allows plate umpire Vanover to shift his focus onto what the bat does, and he makes an outstanding and correct call of "swing," subsequently ejecting Rays Manager Kevin Cash for arguing the proper ruling. E-053|054: Timmons calls a swinging strike. 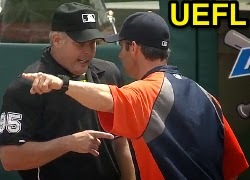 And, like Cash, players, managers, and coaches may subscribe to the aforementioned "ask for help (on a call of 'strike')" myth that we debunked using rudimentary logic, bolstered even further by another portion of Rule 8.02(c) Comment, which states, "The manager may not complain that the umpire made an improper call, but only that he did not ask his partner for help." Taken out of context, this portion of 8.02(c) Comment seems to give managers quite a bit of ammunition due to the sentence not explicitly stating something of the sort, "*Only applies to call of 'ball.'" In context, however, the sentence directly preceding it reads, "The manager or the catcher may request the plate umpire to ask his partner for help on a half swing when the plate umpire calls the pitch a ball, but not when the pitch is called a strike." Put both sentences together, in context, and the issue of redundancy explains why the second sentence about complaining doesn't make mention of whether the initial call was ball or strike. Nonetheless, due to this and other ambiguous or misleading phrases throughout the rulebook, the myth of always-get-help persists, which means umpires must consider whether a manager's complaint has met the Standards for Removal from the Game and, is thus, worthy of ejection or other discipline. So let's recap: Stay with the pitch and get your primary responsibility right. Once you are sure it's a ball get those check swings. Understand that we don't want to be a guy a passes on every check swing. The more games you work the better you'll get. As a sidebar, Rule 8.02(c) helps answer our Case Play 2017-2 - Stealing an Extended Walk, in which the baserunner from first base overran second base on a 3-2 pitch, ruled ball four, and whose check swing was affirmed as "ball/no swing" by the base umpire. At the time, some commenters mentioned that the base runner should be given lee-way due to the "confusing" check swing situation that could reverse the ball four call, but 8.02(c) gives the runner no such privilege: "Baserunners must be alert to the possibility that the base umpire on appeal from the plate umpire may reverse the call of a ball to the call of a strike, in which event the runner is in jeopardy of being out by the catcher’s throw...The ball is in play on appeal on a half swing." In high school, for instance, such remedy may be made, but only if the call is reversed on appeal (e.g., not a "no swing" affirmation). I hope this helps your umpiring. Have a great season. Video available via "read more."